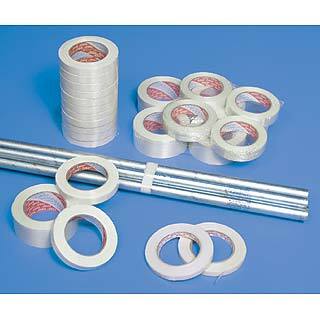 Glass filaments reinforce tape to provide superior strength and holding capabilities. Low-cost alternative to steel and plastic strapping for unitizing and palletizing boxes. Bundles metal bars, tubes, pipes, wood, glass, heavy cartons, and odd shaped products. Secures loose parts during shipment and is high tack and shear. Tensile strength is 160 lbs. per square inch.